Rimfire Films Ltd. 1986. Director: Peter Faiman. Music: Peter Best. LP	(ST)	EMI. EMX 240625. 1986. Gatefold. Written, Arranged and Produced by Peter Best. All AMCOS. Recorded digitally at AAV Australia, Melbourne and Remixed at Paradise Studios, Sydney. Recording and Mixing Engineer: Doug Brady. 1986 Best Results Pty. Ltd/Rimfire Productions. Mick And His Mate Cyril. (0:34). A Walk In The Bush. (2:45). Mick Meets New York. (2:44). Mad, Bad And Dangerous. (2:31). v: Lisa Edwards, Lindsay Field. That’s Not A Knife. (1:34). 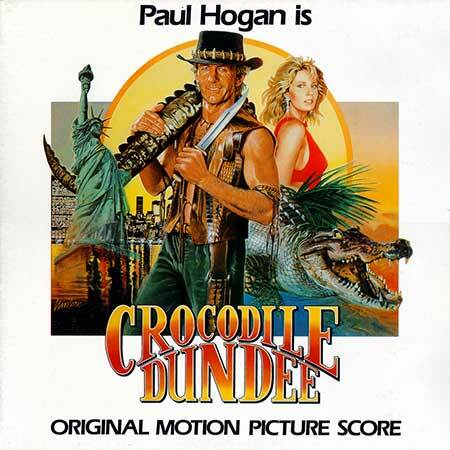 Theme From “Crocodile Dundee”. (4:58). Overture From “Crocodile Dundee”. (3:13). LP	(ST)	Varese Sarabande (USA). STV 81296. 1986.